The best chewy chocolate chip cookies recipe that you’re family will love! These treats are crisp on the edges, soft, chewy center, and gooey with melted chocolate chips. Dare I declare that this could be one of the most amazing chewy chocolate chip cookies in the universe? You’ll be the ultimate judge, but I’m sure you’ll enjoy this yummy taste test! Chocolate chip cookies are the most iconic treats, EVER! There are also endless ways to make each batch depending on if you want them soft-baked, chewy, crisp or chunky. Many have examined the science behind this infamous cookie, which gives me happy geeky butterflies in my tummy. This is the fun part, creating an experimental design on dessert to see what factors change the texture, flavor and overall eating experience. If you enjoy a nice soft and chewy cookie packed with chocolate in each bite, this recipe was created just for you! Cookie kryptonite. I have not one ounce of resistance when it comes to gooey chocolate chip cookies. Super fresh baked out of the oven leads to chocolate streaks multiplying on your hands. It’s an event that requires all senses and a big glass of cold milk to wash down each grainy crumb. Homer Simpson drool! When thinking about what cookie to make during the December cookie-palooza, we were inspired by photos from Lindsay of Pinch of Yum. I changed up the recipe to give it my own flavor, but Jason wanted to recreate a similar photo shoot that makes you want to get off the couch and start baking! Chips, chunks, semi-sweet, bittersweet, how do you choose? For me, I like a simple semi-sweet chip. It’s got just the right balance of rich cocoa butter, sugar, and cacao flavor for these cookies. If you’re still on the fence, grab a fistful of different varieties, let them melt on your tongue and be the judge. I know what you’re thinking, what makes these the best chewy chocolate chip cookies? It starts with the technique of making the batter. The key starts with melting the butter and adding more brown sugar than granulated sugar. The brown sugar is a humectant, meaning that it attracts and absorbs water freely, keeping the cookie moist and chewy long after baking. This recipe has a unique step of whisking the butter, sugar, and eggs for a short period, waiting for a few minutes, then repeat this process a total of four times. This may seem crazy at first, but doing this adds some interesting and attractive texture and appearance differences. In the ten minutes or so it takes to do this process, you will see the mixture change from an oily goop to almost a thick and shiny frosting appearance. What you’re doing is allowing the sugars to dissolve entirely into the batter. The result after baking is better caramelization, a crackly surface, crisp golden brown edges, and a soft, chewy center, yes! I’ve also learned a neat trick to make for a more rustic appearance and more exposed shiny chips on the top of your cookies. As you shape the dough into a ball, you break the ball in half and recombine the pieces together to the portion that was torn is facing up. You can see a full step-by-step in my browned butter chocolate chip pecan cookie recipe. It’s a must-try technique that will make your cookies look even more tantalizing! I like to slightly underbake the center; as the edges cook and brown, you will see it puffing up. At around the 10-minute mark, I take the cookies out and let them cool on a sheet tray for 3 minutes. You can bake a few minutes longer if you want a more cooked caramel flavor. The cookie will level out, and you will get those crunchy edges and tender gooey center you crave. The cookies stay soft days after you bake them, so you can savor each bite just a little longer. I have to admit, I was afraid to make chocolate chip cookies for the longest time. With the high stakes of expectations, I freaked myself out. It seemed like I would always overbake them or they would spread out to become crisp chips instead of cookies. 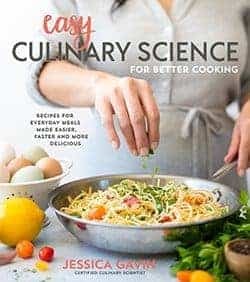 When I finally took the time to put my scientist thinking cap on a play around in the kitchen, I found a recipe that got me high fiving whoever was around. I would love to hear what you think! Give these cookies a try, the worst thing that could happen is you have enough extra sweets to make a killer ice cream sandwich or sundae! How does the type of sugar affect your chocolate chip cookie? 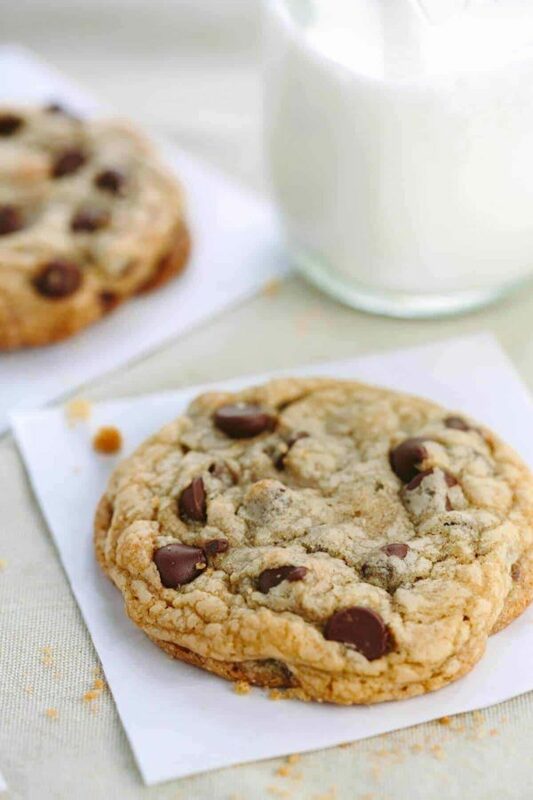 The best chewy chocolate chip recipe that you're family will love! These cookies are crisp on edges, soft, chewy center, and gooey melted chocolate chips. Line 2 large baking sheets with parchment paper, set aside. Heat 10 tablespoons butter in small skillet over medium heat until melted, about 2 minutes. You do not want the butter to get too hot, just melted. Remove skillet from heat. Stir remaining 4 tablespoons butter into warm butter until completely melted. Transfer to a mixing bowl. Add both sugars, salt, and vanilla to bowl with the butter and whisk until fully incorporated. Add egg and yolk and whisk on medium-high speed until mixture is smooth with no sugar lumps remaining, about 30 seconds. Let mixture stand 3 minutes. Whisk for 30 seconds and let stand another 3 minutes. Repeat process of whisking and resting 2 more times until mixture is thick, smooth and shiny (4 times total). Stir in chocolate chips, giving the dough a final stir to ensure no flour pockets remain. Transfer mixing bowl to refrigerator and allow to cool for 15 to 30 minutes, or until dough is chilled and is easy to scoop and roll in your hands. The dough should not feel overly sticky. Divide dough into 16 portions, each about 3 tablespoons and roll into a ball. If the dough starts to warm and get sticky as you roll, place the dough balls on a sheet tray and refrigerate for 15 minutes. Tear the dough balls in half by pulling gently from both sides. Press the two halves together again, with the lumpy torn sides facing upward to expose the chips and give a more rustic appearance. You can add more chips on top so they pop out on the surface. Allow portioned dough to chill covered and refrigerated for an hour or longer on a sheet tray. Arrange dough balls 2 inches apart on lined baking sheets, 8 dough balls per sheet. Smaller baking sheets can be used, but will require baking 3 batches. Bake cookies 1 tray at a time until golden brown and edges have begun to set, but centers are still soft, 10 to 12 minutes, rotating baking sheet halfway through baking. The cookies will look slightly underdone in the center; they will deepen in color and deflate slightly once cooled. Let cookies cool for 3 minutes on the baking sheet, then transfer them to a wire rack to cool completely. I've found that the cookies spread less the longer you can chill the cookie dough balls. Overnight is ideal! These look absolutely perfect, Jessica! I love to bake and do so usually sucessfully, have attempted 5 of the ‘best chocolate chip’ recipes I’ve found online and they have all turned out terrible and totally opposite of the description despite following directions 100%, I almost gave up and decided I’d give this one a try..they came out absolutely perfect! Crispy edges with a chewy gooey center, next time I’d like to try organic dark brown sugar, hopefully the coarseness works out well! Thank you so much for posting this recipe! Hi Kai! I think reducing those sugars would greatly reduce the chewiness of the cookie. You could try it but the cookie will be very different, perhaps more cakey. Are you looking for it to just be less sweet or reduce calories? Hi Kai- Great question! Typically you can replace 1:1, but make sure to read the package instructions. I would not replace ALL of the sugar and brown sugar in the cookie for the xylitol, just the granulated sugar if you go that route. Let me know how it goes! Hi would it make much of a difference if I a added maybe a half cup of peanut butter? Hi Tiann! I have not tried adding peanut to this recipe. I would add it during the step where you cream the sugar and butter together. I would guess that it would have a nice peanut flavor and a little more dense. Let me know how it turns out! Just wanted to let you know these are hands down the BEST chocolate chip cookies I have ever made, and I’ve tried lots of different recipes! Thank you much – this recipe will be bookmarked for many yummy future uses! Wow Jess! That is so awesome, you made my day 🙂 I’m so happy to hear that you enjoyed the cookies! Can I add pecans to this recipe without adversely affecting the chewiness? Also, I want to send some to my daughter, who’s away at college. How well do you think they would mail? Hi, Jessica! Just wanted to let you know my daughter came home from college and I made these cookies (with nuts) for her. We absolutely loved them! I made her two batches to take back with her and her apartment roomies loved them too. This is my new go-to chocolate chip cookie recipe…thank you for sharing! 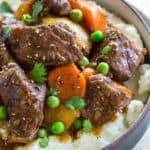 Has anyone tried doubling or tripling the recipe? Just wondering if it changes the texture of the cookies. Thanks! Hi Courtney! I’ve tried doubling the recipe once for my son’s birthday. If you have a large mixer I think it will work. Just make sure to chill the cookies, or even better to let them chill over night. Your recipe called for dark brown sugar, and I used organic because that’s what I generally use – the dough was sticky and it was impossible to form those 16 portions and tear them apart. I had to settle for approximate and then putting them in the refrigerator. I hope I will be able to form them better in an hour when I take them out. Also, could you possibly give weights? I didn’t know what you meant by a cup and a half of chocolate chips – as measured, or as weighed? It will be different based on which chocolate chips you use. Bittersweet chocolate chips can be 46 percent cocoa to fifty or even sixty something. I went with a mix of two kinds. I’ll pause here and finish this note when the cookies are done. They seem to have come out well. They are a touch on the not sweet side, could this be due to organic dark brown sugar? I refrigerated them for almost two hours. It’s interesting, the first tray ended up thin and the second tray more like your cookies – the difference was time in the refrigerator. I wonder why they were as sticky and hard to form? The only other difference was vanilla paste instead of extract on a 1 for 1 basis, as directed by every resource I could find. Vanilla paste has a richer vanilla taste in my limited experience, but it’s still the same amount of liquid. Hi Jan- Thank you so much for sharing your experience! I find it really fascinating what happens in different people’s kitchen, and what you are experiencing is food science in action! I don’t think that organic vs. not organic sugar will affect the sweetness. How much did you pack the brown sugar? What kind of chocolate chips did you use? I recommended semi-sweet which will be sweeter than bittersweet chocolate. I think that the spread you are seeing in the first tray is due to spread affected by time in the refrigerator. Chilling the cookie dough controls spread, because it solidifies the butter in the cookies. Cooler butter causes it to take longer to melt than warmer batter. More chilling equals less spread. Also the longer the dough is allowed to chill, the more liquid can be absorbed by the sugar, binding up any free moisture to reduce the amount of spread. I’ve added a note to the recipe to refrigerate of freeze the dough for 15 to 30 minutes, if you are having trouble with sticky batter. I’ve found this tip has helped me because the batter gets really warm after mixing making the dough more sticky from the warm sugar. Don’t let it completely harden, just enough so it’s easy to scoop and shape. These cookies need a little more TLC, but the results are so yummy! I appreciate your time for making this recipe! Delicious! I slightly cut the granulated sugar and the quantity of chocolate chips to reduce sweetness but the results were wonderful. Thanks for sharing! I put these cookies in a mini cupcake tin, with caramel and hersey’s kiss centers. Other recipes I’ve used come out a little cakey, but this one was perfectly moist and chewy! Though the caramels sank to the bottom, no worries. Still pretty good. Wow what a great idea! Maybe you could add the candy halfway through cooking so the cookie sets a little and doesn’t sink? Recipe is great and easy to follow. My cookies might be a little bit underdone in the center, next time I will give them an extra minute ;). I’m always on the hunt for chocolate chip cookies. And I cant wait to try your version! Thanks Jessica! I printed to make this week to take with us to Pismo Beach. I wanted two types of cookies and I have been wanting to find time to bake and use your cookie recipes. These look wonderful. Also making the peanut butter and jelly recipe. Thank you for a wonderful 2016 of recipes. Wishing you and your family many blessings in 2017. I can’t wait to hear what you think Judy! Your family is going to LOVE all of the cookies and goodies you make for them. I used to go to school in San Luis Obispo so I know where you are headed, such a pretty beach town! Thank you for your positive support, looking forward to sharing more recipes with you in 2017! I have to tell you that I am OBSESSED with these cookies! I always make cookies for my family for Christmas and they all agreed that these are the the most delicious cookies! I doubled the recipe, used all organic ingredients and the cookies came out perfectly. I’m cooling a batch now to take to a New Year’s party tomorrow. Keep up the phenomenal job and have a blessed 2017! Yay Jessica! I’m so happy to hear that your family are enjoying the cookies 🙂 Keep sharing the love! Happy new year! I have to say I made these cookies and they are fabulous. I have been looking for a cookie recipe that doesn’t come out like a hockey puck lol. My husband absolute loved these cookies. I had to hide them from him and my childern. I was wondering if you have a oatmeal raisin cookie recipe just as yummy. Thank you for your feedback Annette! I don’t have an oatmeal raisin cookie, but it sounds like I should make one! Seriously. THE BEST I have ever made. Friends and family said the same. Always perfect. They do turn out a little underdone in the center, but I like them that way. It keeps them super chewy and fresh tasting. Thanks for sharing the recipe! I’ve tried many recipes and this one is the best! My family loves it. Did you ever try to make the cookie a bit smaller, if yes, can you advise the baking time? You’re welcome! Yes! I would make 1 1/2 tablespoon sized cookies. Add a couple chips on top for a prettier surface right before baking. Bake for about 9-10 minutes (bake 5 minutes, then rotate the pan. Bake 4 minutes additional for a softer cookie, 5 minutes for more crisp. Cool on pan for 3 minutes then transfer to a cooling rack). The edges should be golden brown but the centers may look slightly under baked. The cookies solidify more as it cools. If you bake the cookies until the entire cookie looks golden on the surface, it will get too crispy and burn on the bottom. Let me know how it goes! I made your cookies a while ago, and they were absolutely A M A Z I N G! But I made them today again, and they turned out slightly cakey, and did not crackle on the top like last time. The last time I made these, the butter, sugar mixture was very golden, but this time very pale. Instead of spreading out, they stayed as they were and resembled a scone-like top. Any suggestions on what might have gone wrong? Sound like a cookie conundrum Isabelle! If the cookies were cakier with little spread, I wonder if the measurement of flour was correct? Could you have possibly added more than last time? When you mixed the butter and sugar, did you use the same procedure and time? When the butter looks paler, it’s due to the incorporation of air. Maybe you used a higher speed? Did you allow the mixture to rest in between mixings to allow the sugar to dissolve? This gives the nice crackly top. How does your oven temperature look? Sometimes if it’s too hot the proteins in the cookies with set and not allow for as much spread. Also, could you have possibly used baking powder instead of baking soda? The baking soda helps with spread and a crackly top. Let me know what you find! Would it be ok to use light brown sugar? Hi Krystal- Yes you can use light brown sugar, it will just have less of a molasses flavor. hi! I was wondering if I could freeze the dough? Should I defrost the cookies overnight in the fridge or how so? Hi Ana- Yes you can freeze the dough. Just portion them out and freeze on a sheet try, then place in to a resealable plastic bag. You can bake them straight from the freezer, which make require a few more minutes of bake time. You can also defrost the night before in the fridge on a plate, then transfer to a baking sheet. I have made your delicious cookies no joke, four times now, and I am going to make them again soon ;)) Right now I do not have regular chocolate chips, only the mini ones. How many cups of chocolate chips should I put in? And while I am writing this, I am SERIOUSLY craving them so bad ???????????? Gooey, fudgy, chewy cookies… and also, will the regular-sized cookie look weird with mini chips? Whoo hoo Bella! Love hearing that you are a fan of the recipe 🙂 I would start with 1 cup and gently mix that in, and then see if you want to add more. The smaller chips will disperse more throughout the dough, so you may not need as much. The chocolate won’t be as gooey but you will have more chocolate flavor in each bite! It won’t look weird, but you won’t be able to see the chips on top unless you press some in before baking. Let me know how it goes! Thanks so much Jessica for creating the perfect yummy chocolate chip cookie recipe! My 14 year old daughter wanted to make cookies and so I told her to try your recipe…she had so much fun making it and loved your food video. I told her your are a food scientist so I especially told her to read the food science tips too. Loved the crunchy edges and chewy insides! I absolutely love your cookies! This is the recipe I have always been looking for. Slightly crispy on the outer edges, yet gooey/slightly underdone in the middle. I discovered your recipe a year ago in Michigan and made them pretty much perfectly. Then I moved to Nova Scotia and for whatever reason, they haven’t really turned out since. There are only two things that I can account for that might be throwing things off. Being by the ocean might make things more humid, so I was wondering if there might be anything to account for with that? Also what if I were to make these cookies in the high altitude/drier climate? (just curious). And the second thing is that when I made them the first times in Michigan, I was using just regular bleached white sugar, the kind that is finely granulated. Whereas now I have been using organic, unbleached cane sugar that has granules which are definitely larger. Also, just to note…the cookies that I am making in Nova Scotia, still taste great and the dough tastes great. They are just raised and don’t ever really spread as thin. I read your comment on an earlier post, where you said that if you refrigerate less, they will spread more. Do you think that’s a good option if there’s no other answer? Hi Scott- Thank you for making the cookies, multiple times! I think you should first try using the granulated white sugar. 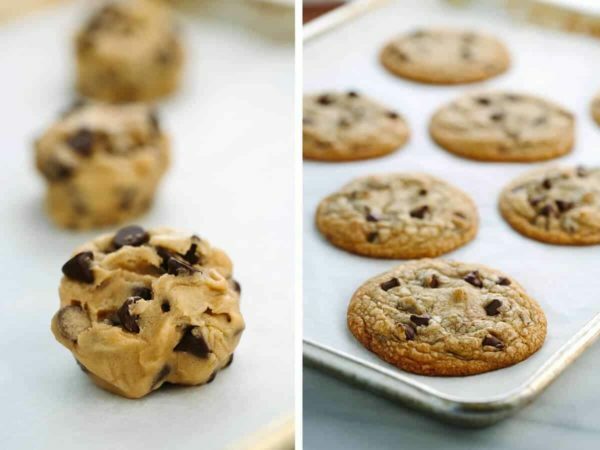 As you are creaming the butter and sugar that helps the cookie dough soften and create more spread. I wonder if the larger granules aren’t dissolving as much, creating a more puffy and thicker texture. If that doesn’t work you can try allowing the cookies to come to room temperature before baking to make it spread more, or flatten the dough slightly for thinner and crispier cookies. Also, you can shape and allow the cookies to refrigerate for 24 hours, giving the ingredients more time to meld for a flatter and crispier cookie. As for weather, I’ve read those extremely humid rainy days won’t make cookies rise as much and have a more crisp exterior, but that’s what you like. Lots of things can happen at a higher altitude which has lower altitude. Are you at a higher altitude? Sometimes leavening agents rise quicker, so you may have to adjust your input. Start with changing back to white sugar, and let’s go from there. Let me know how it turns out! Thank you for responding back Scott, so happy that the tweaks worked for the cookie. Absolutely Amazing. I’ve never in my life commented on a recipe. And I’m an avid online recipe fiend. I can’t wait to make more stuff from your website. Wow, what a HUGE compliment Lisette! Thank you for making the recipe 🙂 I can’t wait to hear what other recipes you try! I can’t wait to try these cookies, and am wondering if you can double the recipe and achieve the same crispy chewy results. I realize I can just make two batches, but with two little boys running around, it would be great if I could just mix up one large batch – as I imagine one batch will disappear quickly. Hi Tess! I totally understand about the cookies disappearing too fast 🙂 The recipe was designed for a single batch in a 6-quart sized mixer. I worry a little bit that doubling the batch won’t provide proper mixing of the butter, sugar, and egg together since that is the most crucial step. Unless you have a larger mixer, I would stick to keeping it a single batch. Great question! Shoot, I wish I would have read this comment last week!! I made a double batch and although delicious tasting, it was a bit of a disaster. It was my in laws restaurant style oven so 375 was way too hot and they flattened out. Again, delicious! but awful presentation. Thanks for the quick response. So, Can I mix all together or should I do the separate batches? And if I do the two or theee batches all together, do I do that first step of 30 seconds best and 3 minutes rest, more than 4 times? Since it will have double or triple the amount of ingredients? Hi Lisette! How did the dough turn out at your in-laws house when you doubled it in terms or appearance before baking? I don’t think to triple the batch would work due to volume in the mixer. If you can I would do separate batches and perhaps make them the night before and chill them so you can just bake them off the next day. I didn’t let it get cold enough but I think the dough was the same. I’m not going to risk it this time, so I’ll just do separate batches. I’ll experiment another time! —-Thanks again for All your help. Ps. I’m on the Keto diet for the next few months so it’s a bit of torture to make them and not be able to taste them. Although I feel amazing and happy to please others with your Ridiculously delicious recipe! You’re welcome Lisette! 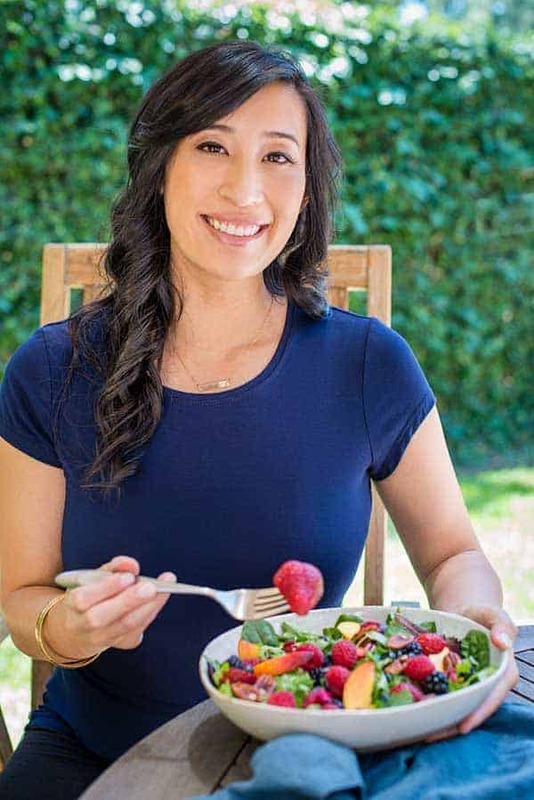 Please let me know how the party goes, I want to see a picture of all the desserts you make 🙂 You are a strong and kind woman for making all those tempting recipes, I know how that feels when I was on whole 30 and recipe developing. It’s certainly a challenge! Can I use unbleached all purpose wheat flour instead? Hi Joey- Yes, unbleached all purpose wheat flour can be used for the chocolate chip cookie recipe. Hello when I make this and put it into the oven it immediately become a a flat round circle. I did 14tbsp of butter as 196 grams, 100g white sugar, 150g brown sugar, one egg, one yolk, followed the exact directions…yet the cookies turn out like puddles. Why do they melt into circles straightaway? Hello, would brown butter make the cookies taste nice or will they change the whole recipe completely? And would the cookies still turn out chewy? Brown butter would be a great addition! Just substitute the amount of melted butter for brown, but make sure to still add the solid butter to the browned butter. This looks like the recipe from Cook’s Illustrated. Please give credit where credit is due. OMG!! Ive finally found the perfect recipe!!! These are DEF crunchy on the outside and chewy guey on the inside! I did make a couple variations. I like my sweets a little savory so I doubled the salt plus I used salted butter, added a half tspn of baking powder, 2 extra tblspns of browned butter, and 1/4 cups of extra brown sugar. I would say the 3 keys to making these not puddle when you bake is to make sure your oven is fully pre-heated, the dough is freezing cold when balling them (not frozen,) and that you triple whip your wet ingredients. Only complaint Id have us we doubled the batch and only got 28 large 2.5″ cookies, so a little less than expected but thats fine because we’ll make a triple batch next time! Thank you for your feedback, Chelsea! I love hearing about your modifications and recommendations. Great job! Chilled dough for longer than 30 minutes but still got flat cookies with chocolate chip mountains. Good flavor but will need to try chilling longer. Sounds like the option to chill overnight is needed. Decided to make these Christmas Eve and am SO happy with the results. Thank goodness I really read the recipe and whipped the butter/sugar mixture and let it rest, I think that was the key to getting the recipe to come out correctly. Also, tried baking the cookies in batches because I literally couldn’t wait to have them chill and decided to test the chill time as an experiment. They really do need an hour in the fridge after being portioned on the sheet before going into the oven, otherwise they spread too much while also being too pale (because leaving them in longer makes them spread more). I love your scientific approach Nicole! I really appreciate you testing out the times (I get antsy too) and seeing how it changes the texture. You rock! Love these cookies, by far my favorite recipe– I like to add chocolate wafers and shards, as well as incorporate the ‘pan-banging’ method by Sarah Kieffer to really enhance the crispy ridges!